Fat Burning Bible Review: It is A Scam! You are here: Home / Blog / Fat Burning Bible Review: It is A Scam! Don’t pay attention to what you’re being told about the Fat Burning Bible by ‘Anthony Turner’ and ‘Dr. David A. Forrest’ of Washington University because it is a pathetic scam! This shabby mess of a product claims to be the ultimate solution to obesity and weight loss but by the time you finish reading this review, you’ll need no soothsayer to tell you that it is just a worthless piece of junk. Created on June 2015, Fat Burning Bible (link to website) is based on a ‘research’ by the fake Forrest and his team, who supposedly discovered that a certain family of bacteria in your intestines called Firmicutes is responsible for morbid weight gain. As usual, this finding was ‘stopped’ from being released to the public by the ‘big pharma’ companies marketing obesity remedies … and this ‘disgusted’ Forrest so much that he quit his job to co-write the Fat Burning Bible with Turner. The scammer even went as far as alleging that Forrest was warned by the ‘big pharma’ for continuing the research and writing the book … and that they also threatened his family over it. 1. 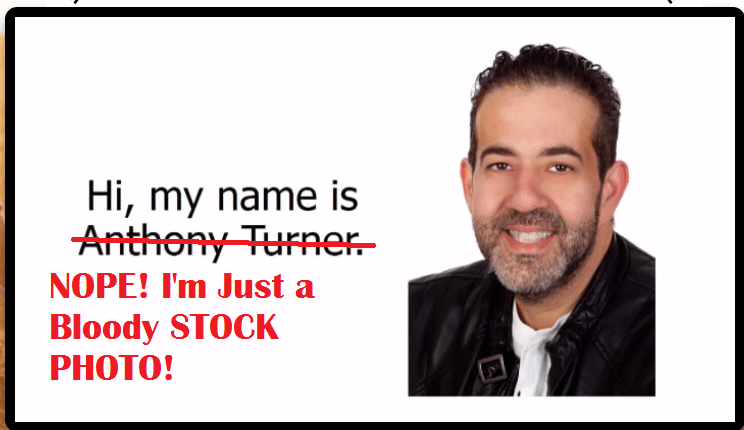 Anthony Turner Does NOT Exist! Turner claims that he is just an ordinary guy who, at 10-years old, was nicknamed ‘Chunk’ (after the fat kid in the movie The Goonies) by his peers for weighing 190 pounds. He went on to balloon to 210 pounds at 15 and by the time he became an adult, he weighed 390 pounds. Turner goes on to claim that he was diagnosed with arterial hypertension in his early 30s and at age 38, suffered two heart attacks caused by the blockage of two of the three coronary arteries of his heart. That near-death experience scared him into finding a cure for his morbid obesity … and that was how he met Forrest and his research. According to him, he lost an incredible 142 pounds in 90 days – exactly 3 months after suffering the two heart attacks – with the help of Forrest’s Fat Burning Bible. I decided to highlight this story to show you the extent of the absurdity of this Fat Burning Bible scam. On top of that, this incredible storyteller does NOT exist! How do I know that? Because you can buy his photo at Dreamstime.com! Here is the link to the Dreamstime image. Legit product owners will NEVER use stock photos as their identity. This is the tactic of scammers, and they do it to protect themselves from being traced and exposed for what they really are. So it is clear that this Turner is a ghost … and so that unbelievable life story above never happened. 2. Dr David A. Forrest Does NOT Exist! Dr David A. Forrest is touted as a medical researcher at the Center for Genome Sciences and Systems Biology at Washington University of St. Louis’ School of Medicine. Well I checked at Washington University and, as expected, no such name ever existed in their database! On further investigation, I discovered that the research about Firmicutes being linked to weight gain actually took place at Washington University School of Medicine in 2006. However, as you can see from Nature (the weekly science journal where the research was published), the scientists involved in the research do NOT include Forrest. He is just a product of the imagination of the scammer, who inserted him there in order to make his product look authentic. And as for the allegation that the ‘big pharma’ stopped the research, ask yourself this question: How come the results of the research still exists online for all to see and use? And it has been there since 2006 (10 years)! If the ‘big pharma’ really stopped the research, then it wouldn’t even be published in the first place! Final Conclusion: DON’T BUY Fat Burning Bible. It is a Scam! Seriously, don’t waste your $37 buying this piece of crap, as you will not even read it! There are reports of people who actually bought the eBook recently, but never received the link to download it, talk more of reading or trying it. So do yourself a favor by ignoring all the pop-ups trying to make you part with your money and putting your cash into something more useful. 2. 21 Day Sugar Detox. If your weight issue is caused by bad food cravings/habits, then this program by certified nutritionist and NY Times bestselling author Diane Sanfilippo may help. Again, read the review firstbefore buying. These products are not guaranteed to work for everybody, but at least they are legit programs that are definitely worth trying. If any of them didn’t work for you, you can easily get your money back by contacting Clickbank or the product owners themselves. If you managed to receive the download link of the Fat Burning Bible and have tried the remedy inside, please share your experience with us below. And please don’t forget to share this review to your friends so that they too will not fall for this scam! I Totally agree with your views, they try to brainwash you. Seems like a good insight has been shared. Moreover, there are fat burners which can be efficiently productive in reducing weight and gaining a good shape. One i can name in ACCUBURN.